After decades of riding (since I was 12) 4 years of being an MSF Rider Coach and even working in the Power Sports industry as a salesman for Wildcat Harley (believe it or not folks I learned to LOVE some of the HDs) a friend's crash and his five months in a coma left me questioning riding. Gaining 40lbs after suffering a broken tail bone and working two jobs lead to long stretches without riding a couple of years back. My wife (who was in a pretty bad car wreck ten years ago) and has a some of her spine fused and as we have aged prolonged rides on the VFR are harder and harder on her. So, it was gradual at first but this year my bike has almost not been out of the garage. We talked about getting a K1200GTL or a Road Glide Ultra for riding together but ended up with a Miata and we drive it somewhere every weekend together. I find myself valuing time with my wife more and more as our work schedules no longer are aligned and we only see each other on the weekends. So, the bike is parked. And some days I really miss riding it. And I suppose I will get back on her maybe in the spring as she needs a chain and sprockets, tires, and really just an over all service now with over 70k on the odometer. I hadn't been on VFRD in a really long time and reading up and seeing your adventures has rekindled a spark. I've thought about having my wife just come along in the Miata and bring our daughter if she wants to come along. Just wondering if anyone else has been through this. If so, how did you handle it? I hardly ride except for the Spring and Fall Rides. Family time trumps me time the rest of the year. I trying really hard to ride while the joy is still with me. Join us this spring and bring your family. We can tell them lies just like everybody else. You ride solo, wife follows in car with kid. They carry luggage. Maybe extra gear for short MC rides 2 up wherever you are going on vacation. This could work. First, TLC the bike, put on your gear, and go. I bet you will rekindle the MC love pretty quick, because it is effing great to ride. My wife and I have done that many times. It started a couple of years ago when after a weekend away my wife told my kids that we got to 200kmh, my oldest was horrified and said to her later "do you realize that if you two have a bad accident you will be leaving the three of us parentless". She's never been on the bike since. So now a few times a year we go away with family in the car, and I ride. We don't stick together as I mostly take the long way, but we have meeting points for brakes, lunch or coffee. We then spend the holiday together, except for a couple of escapes by me to some windy part of the country for a few hours. I just love riding too much to give it away. But, she has always maintained it was my hobby/passion 1st and warding off any critisism of folks after our son was born "how can you let Leon ride?". she however did stop riding pillion until 2 years year or so. So, I'm back at enjoying MY passion, solo. Hey BJJB, I have been down that same road of thought. Specially when we started having kids and I was working as much as possible concentrating on my career. Bike just sat in the garage for the most part. All my old riding friends had pretty much hung up their leathers and I had no one to ride with. I would ride it to work on friday's just to keep it up. Turns out that started becoming M-F weather permitting. Turns out I am glad I didn't sell it even when work slowed down and I could have used the money. My employer said, don't sell it when I mentioned it to some co workers. 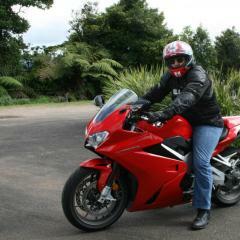 My wife has no interest in riding pillion and refers to my bikes as my mistresses. I joined a local riders forum and began riding on the weekends and making some new friends. Every once in a while I load up the SUV with all the bicycles, Kayaks and fishing gear and meet up with my now grown up family up in Mammoth in the Eastern Sierras. I enjoy taking a day to ride those spectacular passes up there or going on a solo ride home stopping off in Yosemite Valley for the night. Fantastic stuff that makes me glad I held on to the VFR. I maxed out on 3 street bikes and 4 dirt bikes and have found the ceiling of my current interest in motorcycles alone. Pairing it down to 2 street and 3 dirtbikes. Too much maintenance and need to do more fitness bicycling, hiking and fishing to keep balanced. Long way to my point which is hang on to the high mile vfr for your solo riding needs and consider another bike for possible two up trips if your wife is really into motorcycling with you because that is a pretty special thing. Bike won't net a significant amount of money compared to your enjoying it. I sold my 98 running strong with over a 135k miles. Ended up buying a 99 VFR to replace it and the bike I sold the VFR to obtain. Anyways, thanks for bringing up the subject. The highs and lows of motorcycle enthusiasm. While my family is afraid of mc and my riding one, I am living an Allman Brothers Band song: Nobody Left To Run With Anymore. At age 68 I've lost two riding pals, one to cancer and another to a stroke. Luckily, PairOfAces is still available and willing to do some occasional weekend days with. But being retired and still addicted riding weekdays are solo outings. As Phillis Diller said "Getting old is not for sissies. For me it's all about pain management and tolerance. Funny you should mention the Miata. My wife has one and we sometimes pick a scenic destination and "meet for lunch". I take the viffer and she takes the Miata. But like you said, it's really more enjoyable when we both take the car together. Thanks to all that have replied. VFRD was such an inspiration for many years and then Facebook kinda just took over the internet. Found myself going long periods without logging into VFRD. I'll find some way to get back into riding. It's not like I don't still get a huge grin on my face every time I ride. It's just I am somewhat of an insane rider when it comes to miles. 400-500 mile days are what makes me happy. Life just gets in the way more and more often these days of those types of adventures. But, to be clear, the VFR is not going anywhere. I just think I have new toys that have put Baby in the corner. And we all know... Nobody puts Baby in the corner. Right? I have a nice 100 mile loop and some variations. Can be out and back in 2 1/2 or 3 hours. Longer if lunch is involved. Better a half day ride than no ride. But, to be clear, the VFR is not going anywhere. I just think I have new toys that have put Baby in the corner. And we all know... Nobody puts Baby in the corner. Right? Put baby in the corner and don't feel guilty about it. I felt guilty when I had 2 bikes sitting, but with one bike it doesn't bother me. I'm ok with 2-3 trips per year and an occasional day ride. If you're staying active, don't worry about which hobby is being neglected. On the reverse side, I just went 16 months without riding in the mountains and went on the Fall VFRD ride. I rode like crap. I want to regain the feel and confidence again, so the itch is a little stronger. I think we have all been at the feeling at some point in our lives. I raced off-road motorcycles for 15 years back in the 70's and 80's. I mean we rode and raced 35 out of 52 weekends a year and loved every minute of it. Of course back then, I was in my 20's and 30's. I got too old to be competitive racing and I wasn't getting up as quick when I went down, so I called it quits. Bought a bicycle and have been riding for 32 years now. Would you believe my current bicycle costs 10 x what I paid for my first motorcycle? I put about 3,000 miles a year on both bicycle and motorcycle. I still like to ride for the sheer joy of it and to explore roads I have never been on before. At 64 years old, I keep it at +15 mph over speed limit, not crazy, don't do stupid stuff, always looking 360 degrees. I try to keep active doing something I enjoy. I think that is the secret: stay active doing something. I got into classic muscle cars after I quit racing dirt bikes and the kids came along. It wasn't until after the kids were grown and on their own that I decided I would try a street motorcycle. I look at it this way. If I get too old to ride the bicycle, I will ride the motorcycle. If I get too old to ride the motorcycle, I will go cruising more in my 1969 Mach 1 Mustang. But I am riding bicycles with two fellows who turned 80 last year and they are going strong. We change as we get older, interests change, other people come into our lives. Shoot, I got three grandkids now and the thought crosses my mind, 'Should I really be out here on the motorcycle?' It does make you wonder. Thanks for listening. Be happy and safe. I have 3 grandsons, visiting this weekend. The rental car is a Hyundai Accent. I wish I had a bike here. Just tripped across this thread this morning. A LOT of people have "lost the love" or moved on to other things....or just aged. Many of the posters, including me, never missed a day of not being on this forum 10-12 or more years ago. It used to be a VERY active forum with more informal mountain riding in my area, more interest in bikes, etc., more socializing, etc. TMAC's used to be bigger with us taking up the entire Franklin Motel before it was bulldozed away. Motorcycling just isn't as popular as it used to be as I see in my much less frequent trips to the Smoky's. There's new generations moving in and other's moving out. I also think "The Great Recession" affected how people spend their money and time. It is what it is. I don't ride a lot. Never have, except for the time when I still considered commuting to work on a bike to be fun. So, my love for the sport is expressed during the annual trip to NC and 10-15 local rides. It's enough for me and I enjoy and value every ride. A while back Nick Ienatsch had an article in which he said if you are losing the feeling or bored, empty your garage and refill it. The '07 Tuono more or less sold itself. That go me started. The VFR was not hard to sell, gone within a couple weeks or so of going on the market. That left me with just the '03 Tuono, and now I had some cash in hand so it did not take long to bring home a '14 Monster 1200. What a great bike, best I have ever owned. Nothing against the others, all were good bikes to me. But how can you not like less weight, more power, traction control, and ABS? Try something new, variety is the spice of life, 2003 Aprilia Tuono for sale will spice you up good for $3,000. Make offer. Or one could get a vintage bike. You go in with low expectations and come out in love. Easy to work on, most are cheap, and you can form a bond because you saved it. 1981 CB750F Super Sport, I love these bikes. So much character, so much fun. The old bikes are easy to work on, can be had on the cheap, and are still great fun to ride. There is still a lot of love for these bikes also. Multiple people have stopped me and asked if they could take a picture of it while I am out riding, what a hoot. One guy wanted to chat about how he used to have one "just like that", another never owned one but always loved them, etc. Apart from riding motorcycles I also ski (snow), have flown paragliders, and I drive trucks for a living. As a younger man I served in the military, (was lucky enough not to see active duty!) All are hobbies/occupations that carry risks. Yes riding motorcycles is risky ( I did a great Superman impersonation when I was 19 but was able to walk away with a broken wrist) I try to be as safe as I can but in the words of Garth Brooks “Life is not lived it is simply survived if your’e standing outside of the fire” ( I think there the correct words?) Like you billyjackjimbob my wife has a miata (we call them MX5s in Oz) and they are a very fun drive, if only you could make them lean in the corners!! Enjoy whatever poison you choose, LIFE IS SHORT. In My Garage::A bin of 5th gen parts. I first saw this on the Pacific Coast riders forum (IPCRC) in 2011. It was reasonably popular back then, and earned it's producer some industry awards; maybe its already been posted on VFRD. As a boomer who has already entered my retirement years, I sometimes wonder how long I can keep riding before I become a serious danger to myself and others. I find so much enjoyment in riding; for me, motorcycling is my "fountain of youth". It will be a sad, sad day when I realize it's time to call it quits. What a great video. Brought tears to my eyes. Inspirational indeed! Until a month ago, I hadn't ridden since, I think, TMAC 2012. Moved to Colorado in 2012, had problems getting the bike plated, put it on the back burner, got into other hobbies. A couple months ago, my co-workers egged me back into riding, however my VFR has developed lots of wiring problems in those years of down time. I picked up a 2018 Tuono on 9/8 and put 3000 miles on it since. I just logged in to VFRD for the first time in a long time as well, since I had a new PM notification from 2013. Good to see a lot of old friends in this thread.